I was sceptical but Rovio's new game is almost as adictive as Angry Birds. 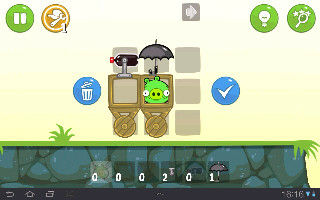 Basically you construct small machines to help the pigs travel to collect pieces of a map. I played it for five minutes and already I'm hooked! There are wheels and different methods of propulsion such as fans, coke bottles along with breaking systems like umbrellas. Disclaimer: I am in no way associated with Rovio.